A car bill of sale would be imperative when a vehicle owner is about to sell his vehicle to a buyer. It could be his private car or boat or motorcycle. Such a bill of sale legally certifies the transferring of ownership of his automobile to the buyer and that too at the agreed price. 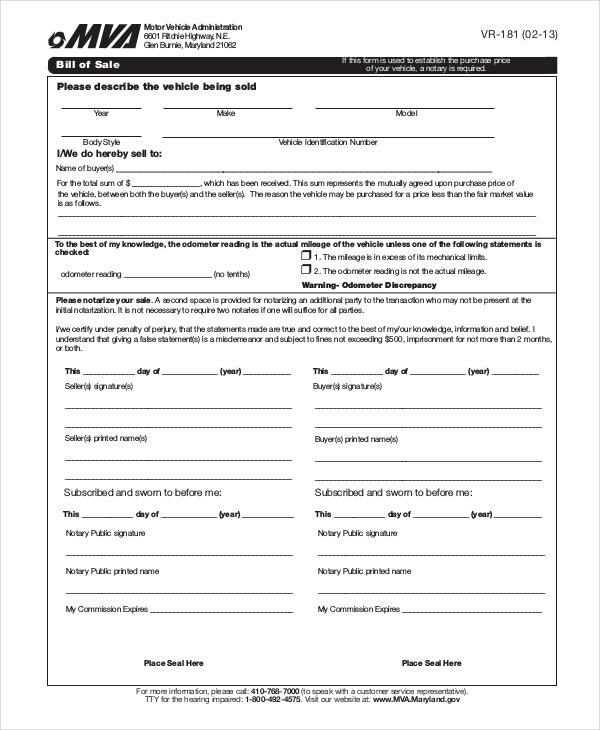 Important information about the vehicle would be mentioned in the form and it must be signed by the notary public. You have an elaborate vehicle bill of sale template here that starts with the owner declaring about his ownership, followed by car’s information, and the fact that the seller is acknowledging receipt from the buyer. 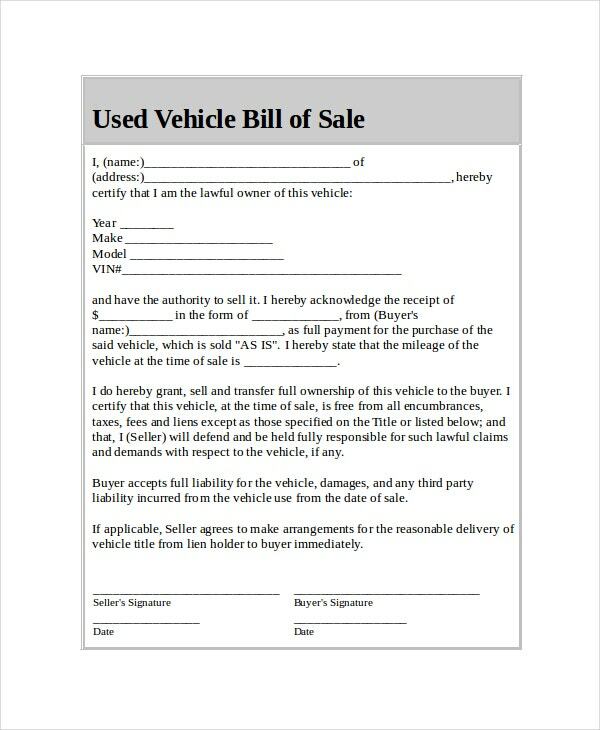 This generic car bill of sale template opens up with basic information on the vehicle to be sold and then includes information on the seller and buyer. There is a box to notify if the vehicle is being given as a gift. 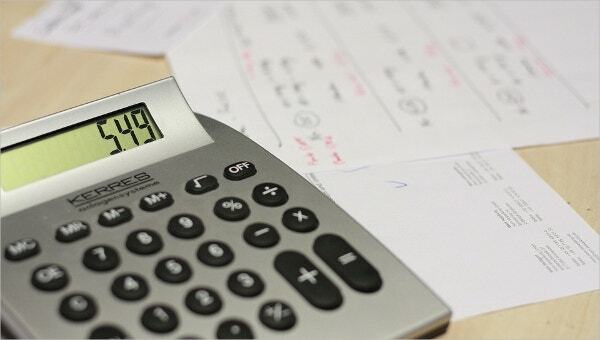 > What Constitutes a Car Bill of Sale? A car bill of sale contains 3 main parts. First of all, it will include data on the important aspects of the vehicle such as make, model, year, body style as well as VIN code. Then, it would include the details of the seller and buyer including their full name and address. Another important part of the car bill of sale is the legally binding authorization from the seller that he is the owner of the car on sale and that he is transferring the ownership rights to the buyer. 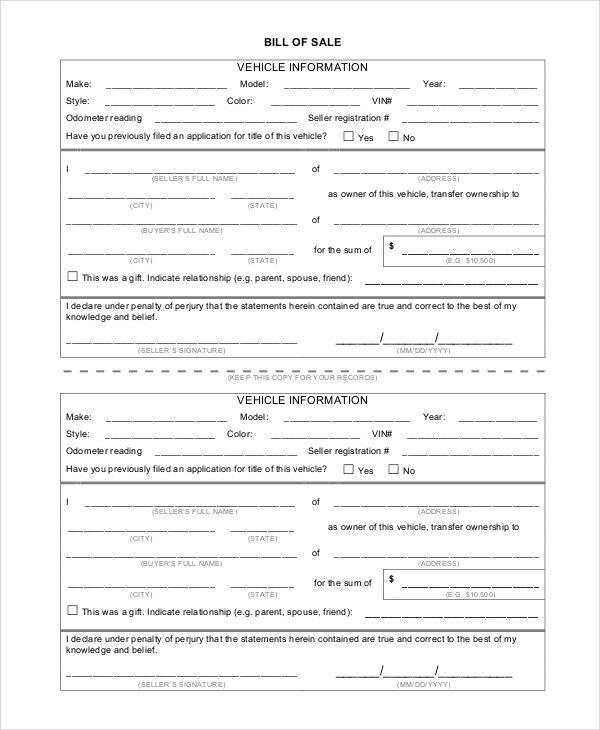 The selling price of the vehicle would be noted on the form. You can also see Vehicle Bill of Sale Templates. 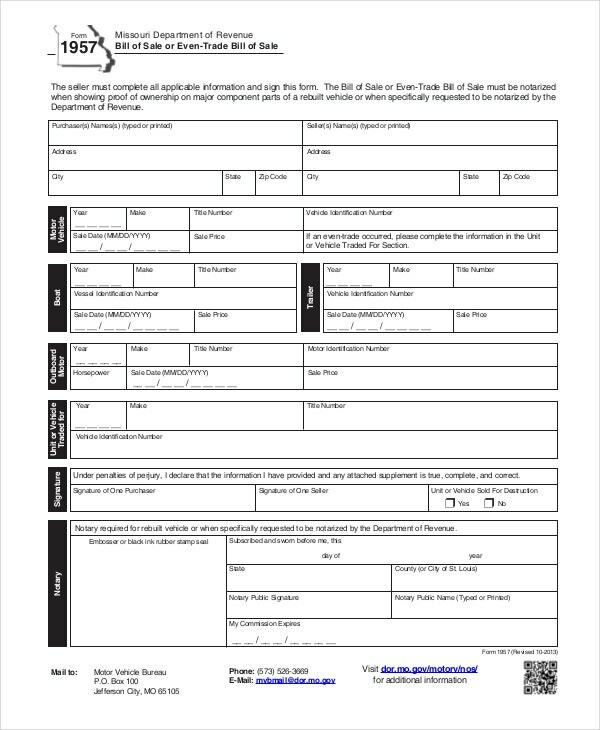 This car bill of sale can be used for selling a motor vehicle, boat, or outboard motor. 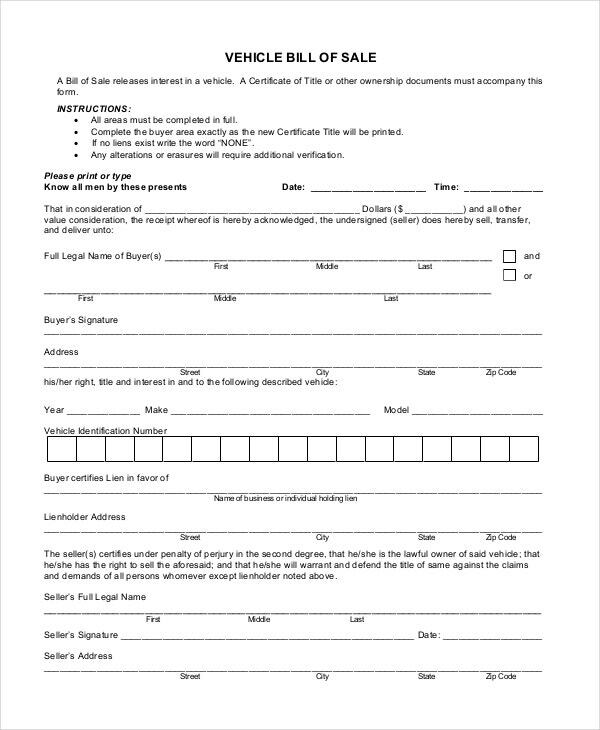 The form is applicable for rebuilt vehicle on sale and would be signed by the notary. You have a neat automobile bill of sale here where you have the seller declaring the sale of the vehicle to a certain buyer- followed by information on the vehicle and details of both seller and buyer. Added to general information on the vehicle, this car bill of sale template offers space for odometer reading of the car which is to be filled by the seller. It also contains space for buyer and seller details. > What is the Benefit of Car Bill of Sale ? 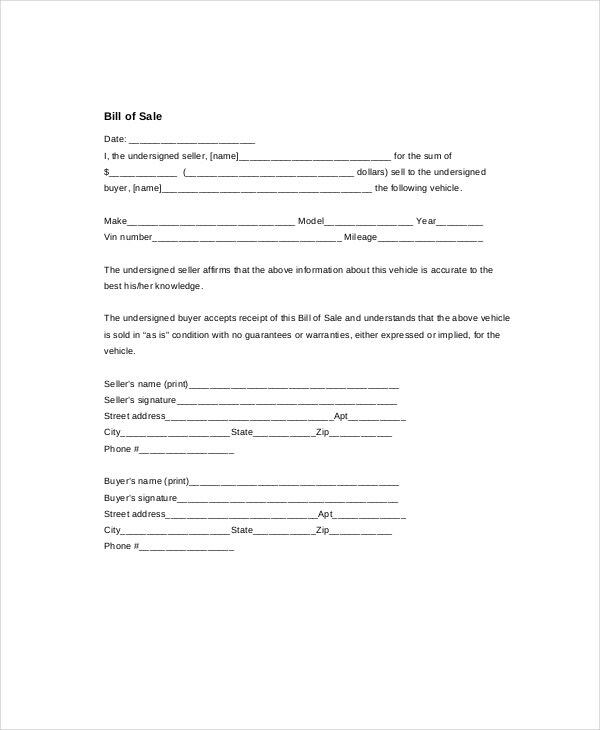 The bill of sale template is beneficial for both the buyer and the seller. For the buyer, it would act as a legal proof that the seller has sold it to him on a certain date and at a certain price. Moreover, as such forms come up with crucial information about the vehicle, the buyer can charge the seller in case the mentioned data turns out to be wrong. As it’s a legally enforceable form, the seller is bound to face consequences in case of any wrongful detail. For the seller, the bill of sale serves as the proof of his ownership of the vehicle that would further help with easy tax reporting. If you need ideas on a car bill of sale, the templates mentioned above would be the thing for you. Designed by experts, all of them are standard car bill of sale samples packed with readymade sections on all important aspects of such a form. All of them can be downloaded and customized easily with your own data.